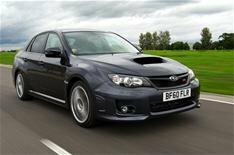 More power and kit for Subaru STI | What Car? Subaru has announced performance and equipment upgrades for its WRX STI. Cars bought between April 1 and June 31 will come with satellite-navigation and a power upgrade to 316bhp but no increase in the 32,995 price. This extra power gives the car a 0-62mph time of 4.6 seconds an improvement of 0.3 seconds. The Pioneer sat-nav includes Bluetooth and MP3-player connectivity and a touch-screen interface.